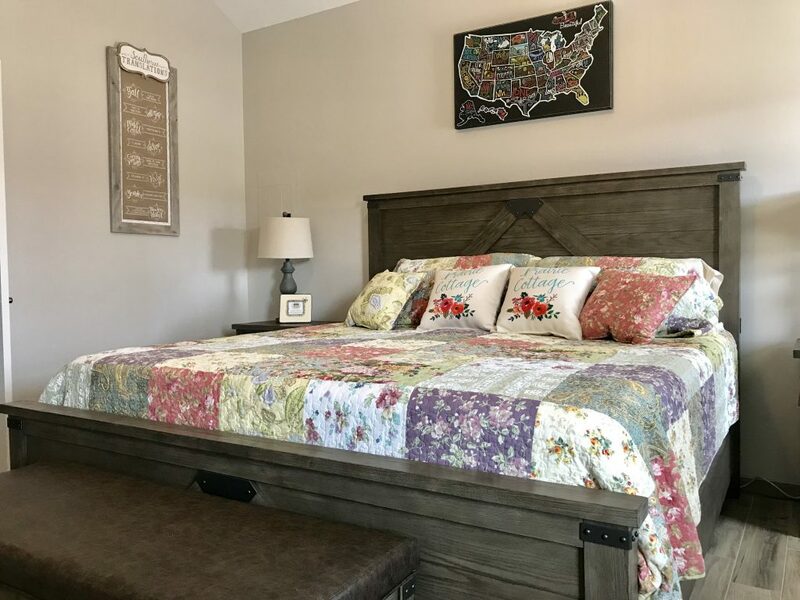 Turns out, The Pioneer Woman’s hometown of Pawhuska, Oklahoma, is also home to a number of great bed and bath properties. We have done our best to spend the night at as many as possible. Each property is unique and provides an individual experience. Every place we’ve stayed has also been exceptionally clean, managed by friendly people, and have reasonable prices. If you’re planning a visit to Pawhuska, we encourage you to book a place in town instead of settling for a chain hotel in another city. Staying right in town gives you the real experience of life in Osage County and the hospitality there is second to none. Here’s a rundown of the many wonderful places we’ve slept in Pawhuska. Stephen and Tiffany Poe are owners of this stately home located just up the hill from The Mercantile on Grandview Ave. This house, formerly owned by Ree and Ladd Drummond, has been beautifully restored and decorated. It is absolutely charming. Grandview Inn Bed and Breakfast in Pawhuska, Oklahoma. We enjoyed our stay in the Peacock Room at the Grandview Inn B&B in Pawhuska. Guests are welcome to hang out in the living room and watch TV or head to their well appointed, comfortable accommodations upstairs for a good night’s rest. Each room is uniquely decorated. In the morning, you’ll come down to wonderful aromas wafting out of the kitchen promising a fresh, hot breakfast. Steven Poe’s eggs Benedict at the Grandview Inn was delicious. We loved sitting at the dining room table and sharing a delicious breakfast with other guests while chatting with the Poes. If you want to stay there you should know that some of the rooms have a private bath attached, while others share one. Ann and I stayed in one of the “shared bathroom” rooms, and it was never a problem. Plus, the Grandview has an on-demand water heater meaning that everyone gets all the hot water they need. This inn is also popular with large groups traveling together as they can share the whole house. See their website for more information. What we enjoyed most: Visiting over a delicious breakfast with Steven and Tiffany Poe and their adorable children. Lauren and Cody Garnett, who are also proprietors of the World Famous Buckin’ Flamingo, own this whole house B&B property located just around the corner from Handy’s. This home can sleep up to 13 people, but Ann and I enjoyed the space just for ourselves, as well. The Flamingo’s Nest is a perfect place for a large group of people to stay. This is a great house for your family or a group of friends. It offers a full kitchen, dining room, pool table, living room with entertainment center, as well as three bedrooms and three bathrooms. It also has covered parking behind the house which was great for keeping us out of the sleet as we unloaded the car one cold night. The Flamingo’s Nest is such a fun place to stay, especially with this pool table. Thank you, Lauren and Cody, for the complimentary night in your wonderful property. We slept really well! What we enjoyed most: Having an entire house to ourselves! 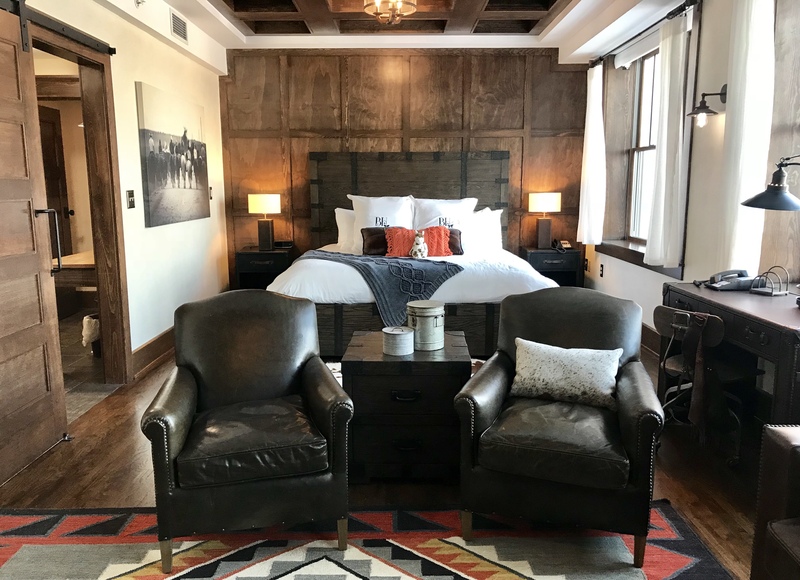 With eight unique rooms in a totally renovated building only two doors down from The Merc, The Pioneer Woman Boarding House brings “cowboy luxury” to life with amenities like custom-made coffee brought straight to your room each morning, and a wine and cheese reception each evening. The Tack Room at The Pioneer Woman Boarding House. 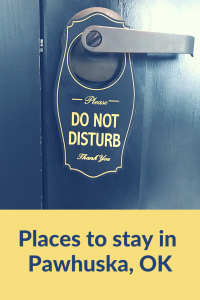 In addition, guests at The Boarding House enjoy valet parking, room service, and even get reservations so they can skip the line at The Merc. This may all sound too good to be true, but it is all very real. 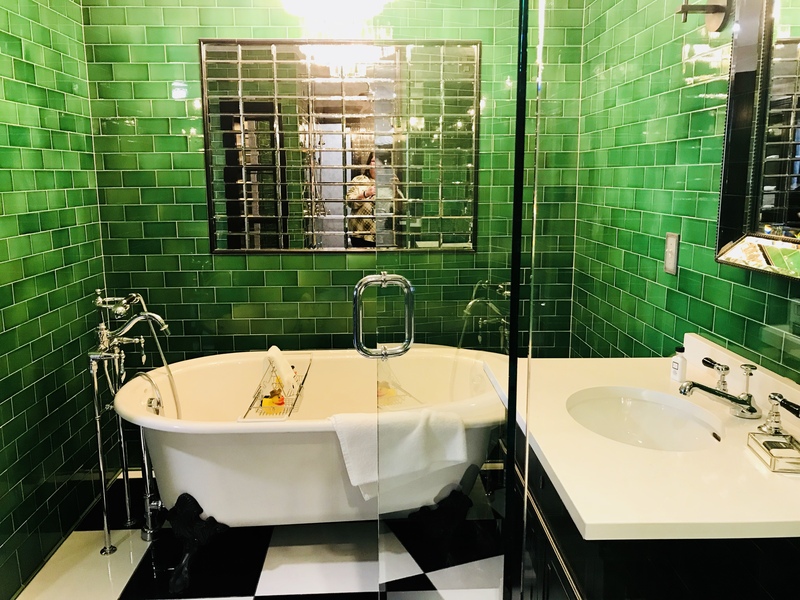 The bathroom in the Emerald Room features a claw foot tub and a walk in shower. Add those VIP amenities to the huge, spacious rooms with genuine Tempur-Pedic mattresses and luxurious bathrooms that have to be seen to be believed, and you’ll find yourself immersed in a beautiful, relaxing place you won’t want to leave. What we enjoyed most: Visiting with staff and other guests over complimentary wine and cheese. And, of course, the his and hers toilets. The Redbud Cottage is a charming house located on 7th street. This whole house rental offers three bedrooms, two bathrooms, and an attached double garage. 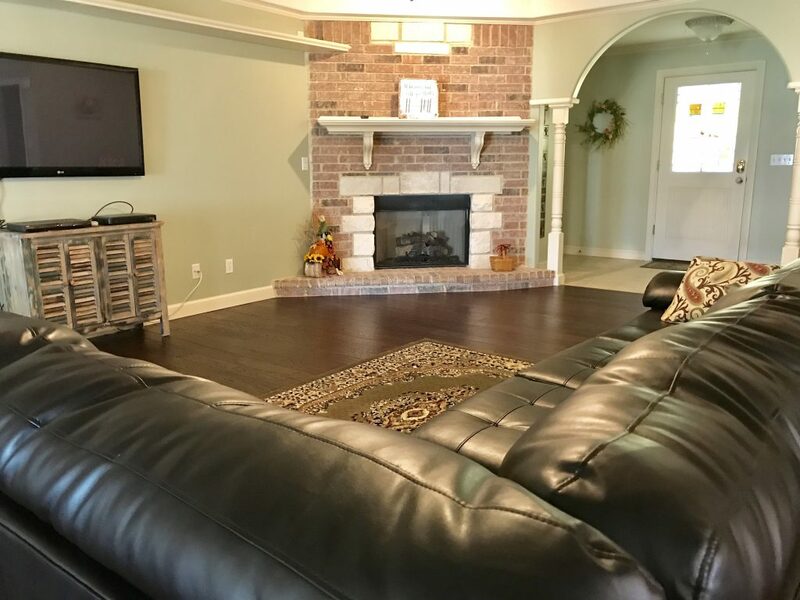 There is a large living room and open floor plan at Redbud Cottage in Pawhuska. 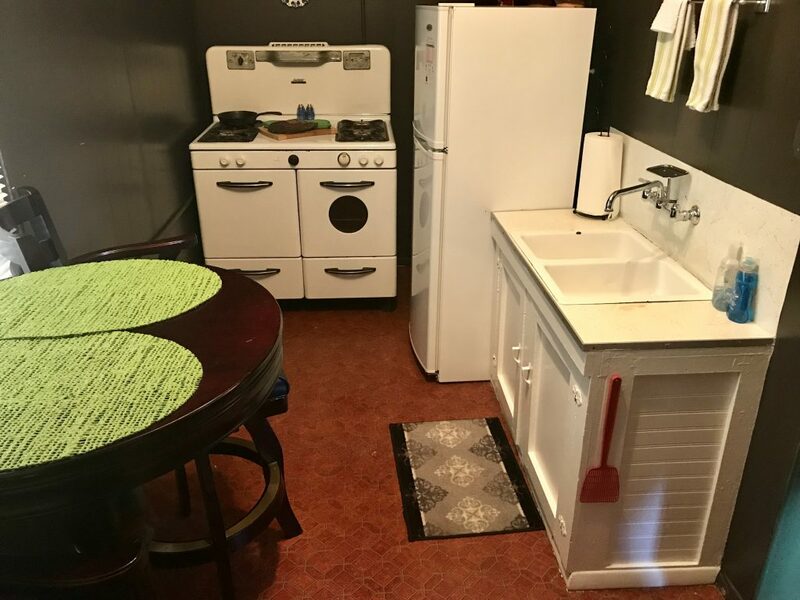 It also has a full kitchen (with Pioneer Woman dishes and pans), dining room, living room, sunroom, and fenced-in backyard complete with a gas grill. All this makes it a perfect getaway for a family or for a group of friends hoping to explore The Merc, Pawhuska, and Osage County. 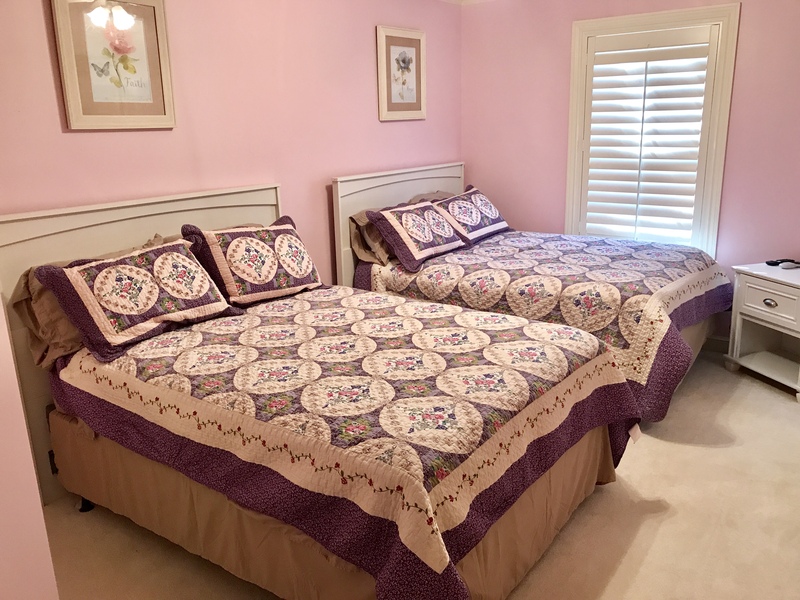 Redbud Cottage is a perfect place for a girls weekend getaway. We took our moms there and loved the flexibility we had being in our own house. We could make coffee (it’s provided!) when we wanted, and even prepare a full meal. Plus, being just a couple of blocks from downtown, the house is super convenient to so many amenities in Pawhuska. What we enjoyed most: The water pressure. Seriously, one of the best showers I’ve ever had. 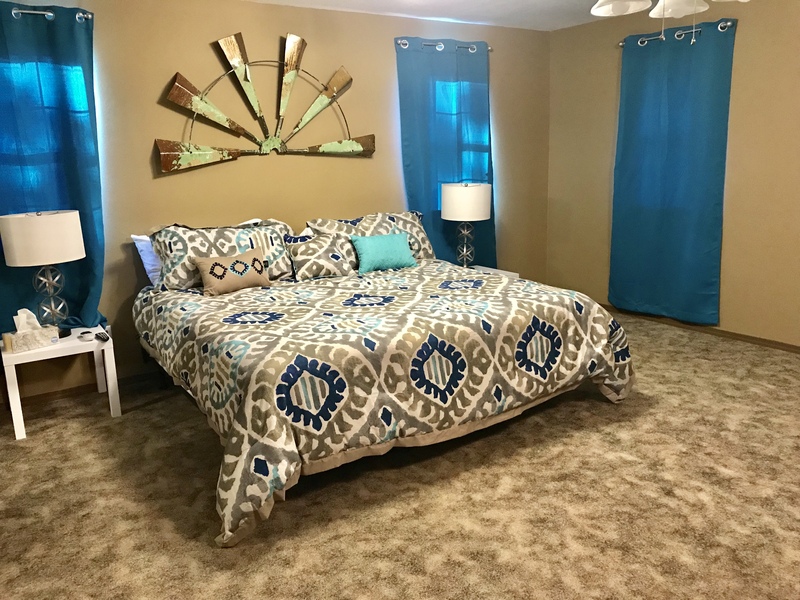 Overlooking downtown Pawhuska and across the street from the site of the Million Dollar Elm and the Osage Nation Museum, sits this charming bed and bath property that has been fully renovated. Owner Cheryl Potts has decorated each of the four guest suites in the house with heirlooms from her family that show her unique style and personal flair. A sunny sitting room at the Million Dollar Inn in Pawhuska, Oklahoma. 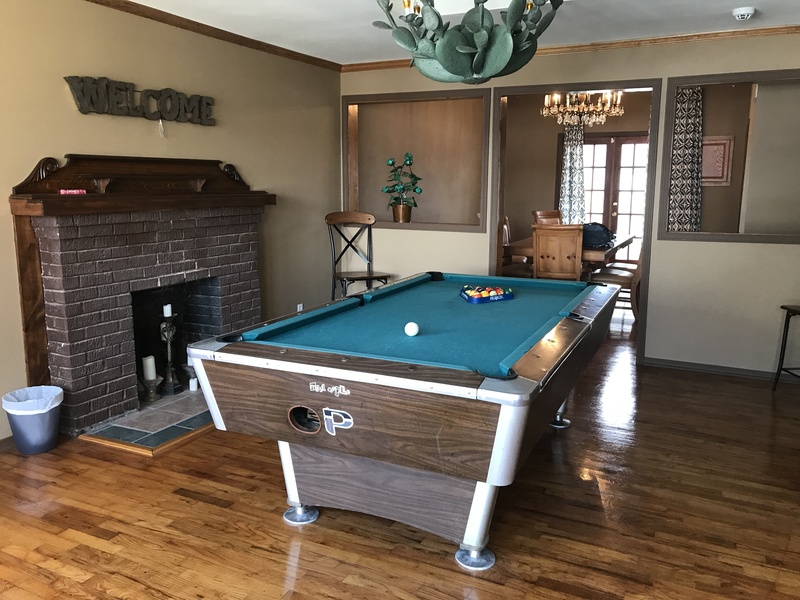 The house boasts a common area with a TV and large windows that offer a lovely view of downtown, making this property a nice one for groups traveling to Pawhuska together. In addition, each suite is equipped with its own kitchenette and full bathroom. The Million Dollar Inn in Pawhuska, Oklahoma. It is definitely worth noting that our bed was super comfortable. We spent a lovely evening visiting on lawn chairs outside with Cheryl and her husband who were a real pleasure to get to know. We’d like to thank them for the complimentary night we spent in this great property. What we enjoyed most: A very comfortable bed and soft, luxurious bedding. Oh, and the view. 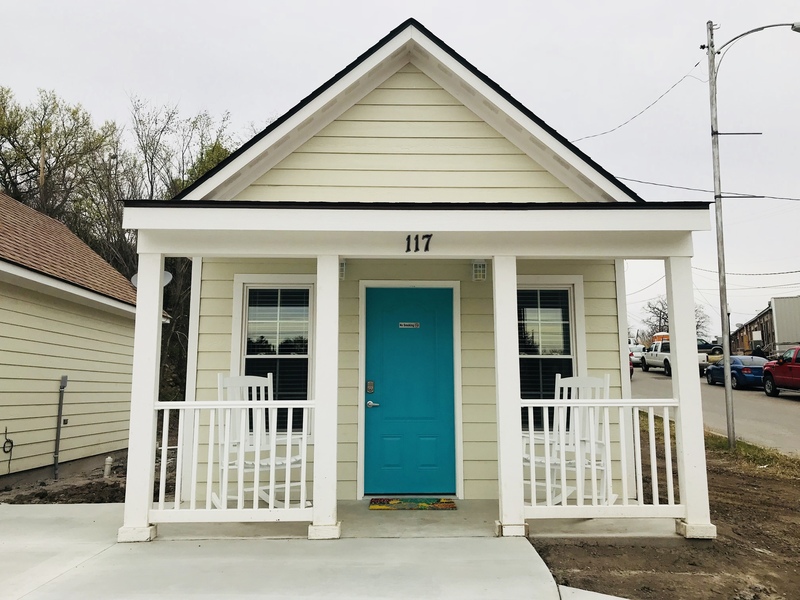 We stayed in one of these on a recent trip to Pawhuska, and were among the first to do so as these newly built cottages just opened in the spring of 2018. Two cottages occupy what had been a vacant lot on Main St. next to the Prairie Cottage store and are conveniently located about 89 steps from the Merc. The Prairie Cottages are located just steps from The Pioneer Woman Mercantile in downtown Pawhuska. 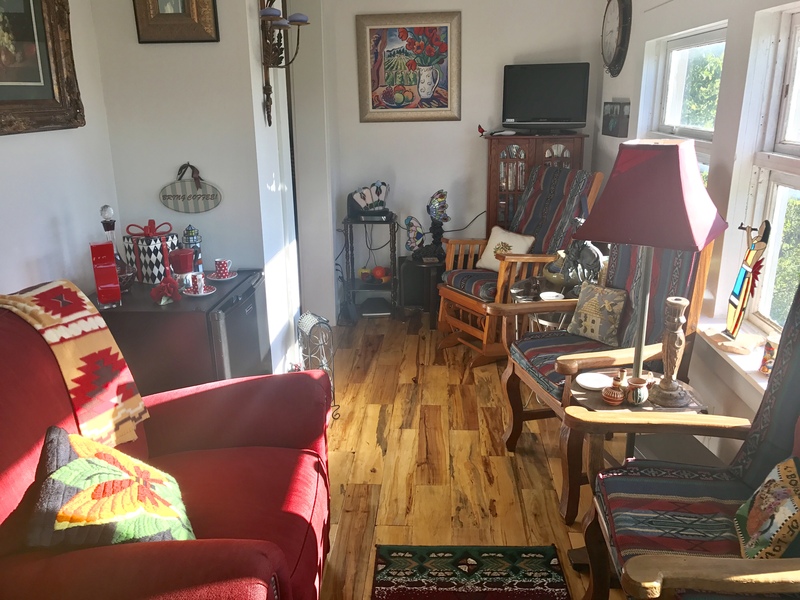 The inside of the Prairie Cottage in Pawhuska, Oklahoma. One of the cottages has two queen beds, while the other features a king bed. 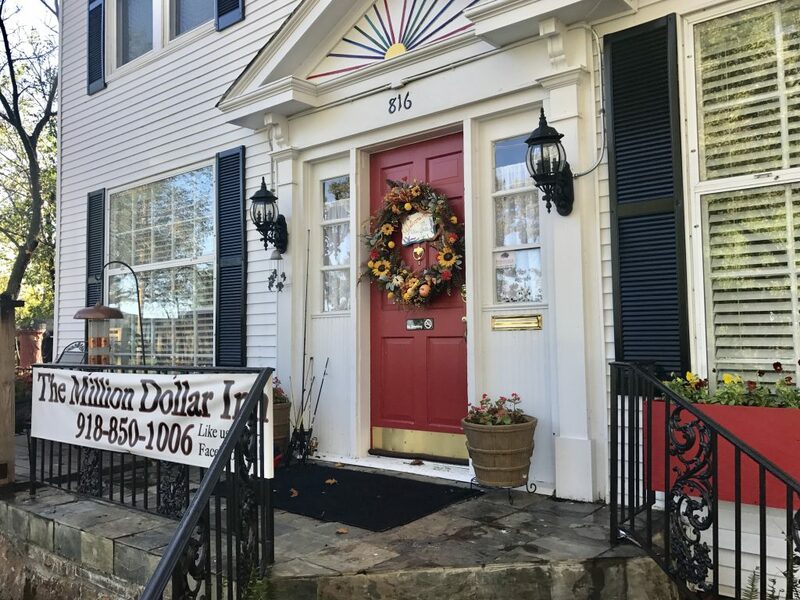 These cottages both have all the modern amenities you’d want in a hotel room (including coffee, a coffee maker, and WiFi) while still giving you the privacy of your own building. What we enjoyed most: The location. I’m pretty sure I could smell Ree’s chicken fried steak from the front porch. This hotel, built in the 1920’s, is about two blocks up Kihekah Ave. from The Merc and offers some of the most unique rooms in town. Located above the Osage Square Mall, the rooms were originally efficiency apartments for newlyweds and oilfield workers. 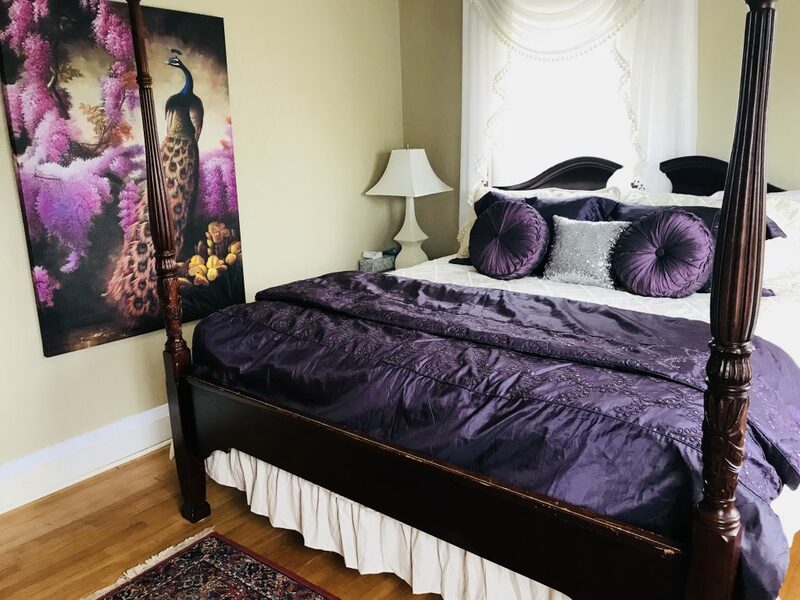 Over the past 30 years, the apartments have been renovated into unique rooms that retain a historic feel, some with the original Murphy bed frames from the 1920’s. 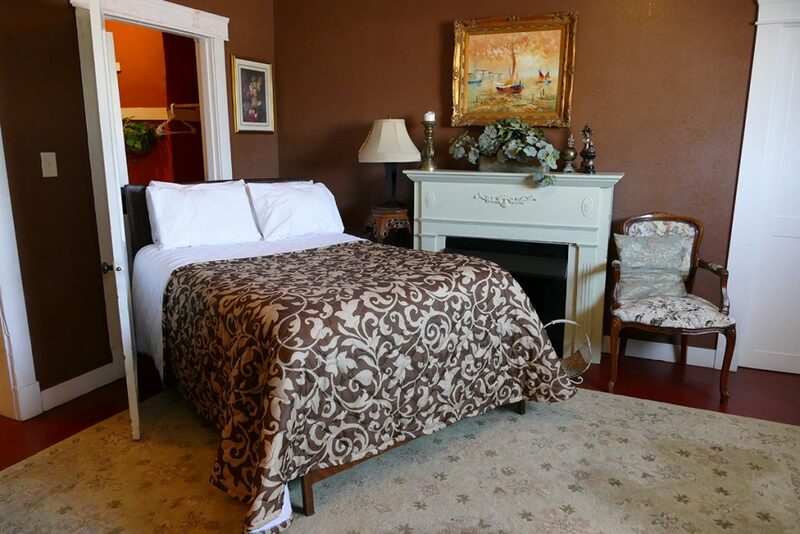 The French room at the Historic Whiting Bed and Bath. Courtesy photo. The Whiting Bed and Bath has so much character and history. 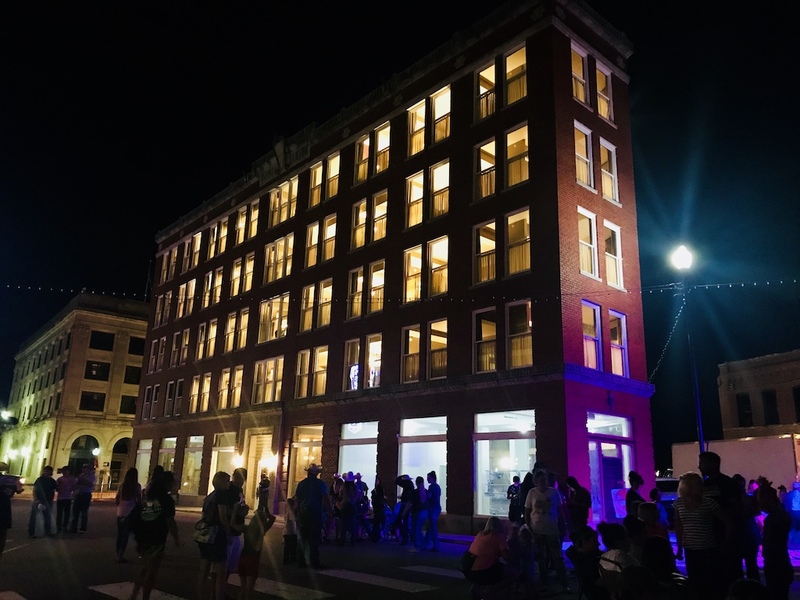 With chairs to take outside onto the shared balcony, you can spend time watching the comings and goings in downtown Pawhuska. Some of the rooms have only a large, antique clawfoot tub with no shower, so ask when you make your reservation if that makes a difference to you. No matter which room you choose, however, it is sure to be clean and comfortable. This property is also excellent for large groups traveling together. What we enjoyed most: Ann loved bathing in an old fashioned claw-foot tub. Even though we’ve really gotten around, there are still a few more places we’d like to try. The Little Rainsong Loft, located right on Kihekah Ave., is definitely at the top of our list. It offers, among other things, a yard with a fire pit and sleeping accommodations for a group of people. A recent addition to Pawhuska’s lodging scene is the Oilman’s Daughter. Owned by two sisters who are some of the friendliest folks we’ve met, they spent months renovating this home and making it a beautiful and luxurious place to stay. 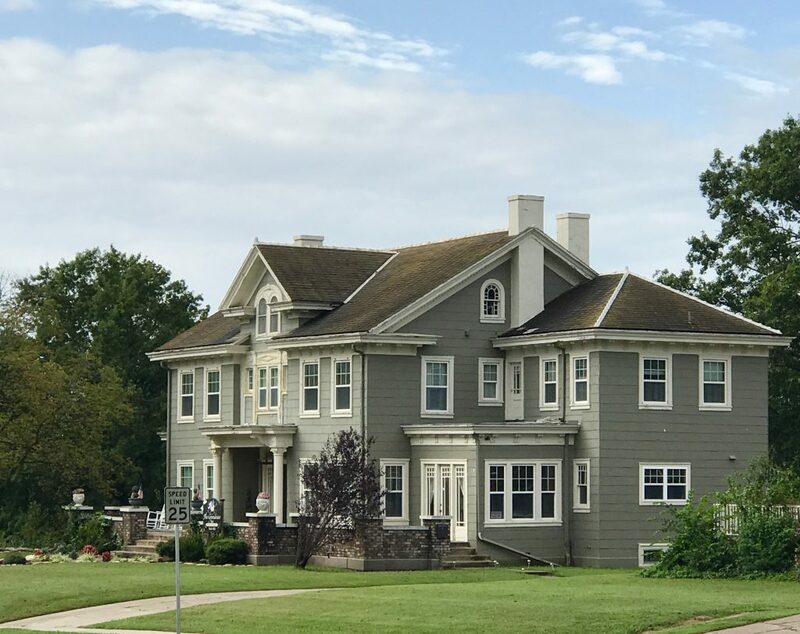 Then, there’s the Maybelle, another old Pawhuska mansion that has been turned into a B&B that we’ve heard is absolutely beautiful. The Wah-Zha-Zhi house, located close to downtown, has two fully renovated efficiency apartments that are available for rent. JJ’s Place, Park Place Bed and Bath, Gray Haven, and Haven on the Hill are all full-house rentals in town. Finally, the Lodge at Taylor Ranch is a bit out of town, but it is located on a championship disc golf course and offers a lake view. The Frontier Hotel includes 20 rooms in what is known as the Triangle Building just across the street from The Mercantile. We’ve anxiously watched the renovations year and are excited the hotel is now open for business. 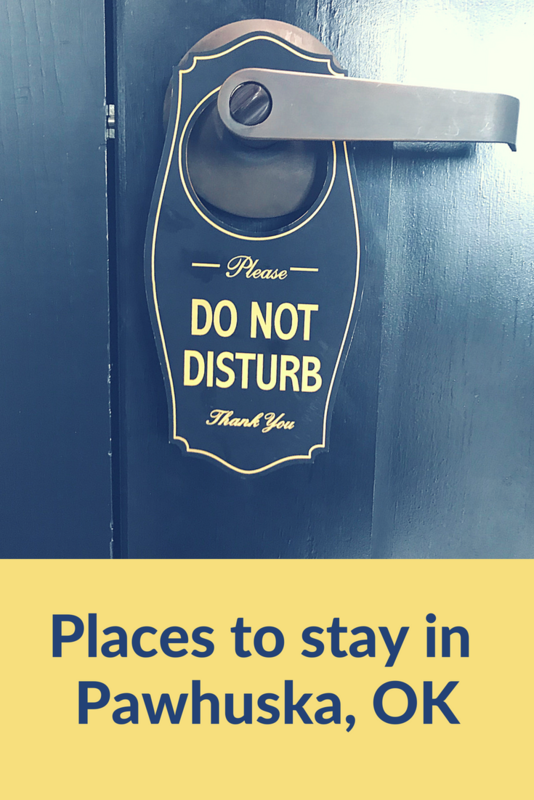 With this many options when you plan your next trip to Pawhuska, make sure that you try to stay in town. 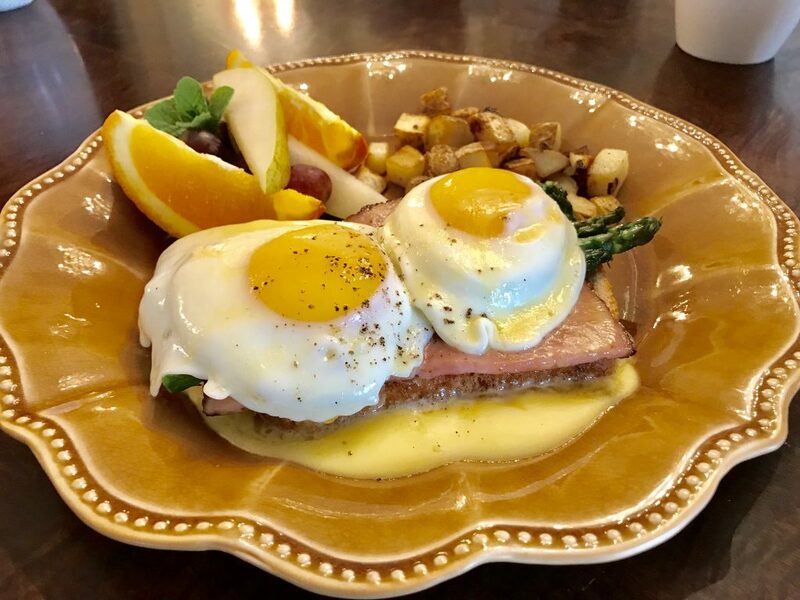 You’ll be close to the action, which in a small town is refreshingly little, and you’ll be the first one downtown for a Pioneer Woman breakfast in the morning. Have you slept in Pawhuska? Tell us about your experience in the comments below. Love how you wrote this post and how you love sharing your joy for traveling and Pawhuska. Thanks so much! We’re glad you enjoyed it. Thanks for following along on our journeys. Great article! Always enjoy your Pawhuska visits. We would love to have you as our guests at JJ’S Place and MJ’S Bunkhouse in Pawhuska. First of all – You guys kill me! I am laughing out loud. It is so nice that you can share your open marriage with the world! LOL! What a cute post and you share brand new places for my husband and I to sleep around. I would love to visit Pawhuska. Never been to OK!